The Tangent Theta TT315M is an intermediate-range precision purpose built tactical riflescope designed for police and security forces. The TT315M is the latest product from Tangent Theta that offers shooters with unfailing ruggedness, mechanical precision and unsurpassed image quality. Designed as a reduced-weight professional marksman rifle scope, the TT315M incorporates precise adjustment mechanisms with zero stops and mechanical revolution and windage direction indicators that virtually eliminate adjustment errors. The optical path has been optimized for unsurpassed image quality, allowing the operator to see minute target detail and to remain in the aim for extended periods without eye fatigue. The TT315M provides innovative features such as the Zero Stops, Mechanical Revolution and Windage Direction Indicators, Articulating Lens Covers, and Integrated Parallax and Illumination Knob. The TT315M comes in various Mil based reticles in 0.1 mrad clicks such (Gen 2 mil-dot, Gen 2 XR) or with MOA models 1/4 MOA per click ( MOA Calibrated Reticle). 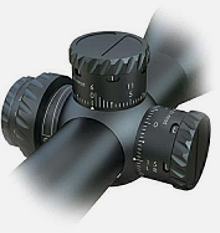 TheTenebraex Articulating Lens Covers can be rotated 360° and set to open according to the user's preferences, flipped back 270° to reduce the profile of the scope and improve visibility of the knobs while in a shooting position. The Integrated Illumination/Parallax Adjustment provides more ring mounting space. The pull out illumination knob has 11 intensity settings with a power-down between each numbered setting and a six-hour auto shut off. 12 mrad Double Turn knobs are standard on the Tangent Theta TT315M 3-15X50 providing 0.1 mrad click per hash mark as well as the MTC (more tactile click) option. The double turn knob also features Mechanical Revolution and Windage Direction Indicators that provides the operator a visual reference of elevation travel range and windage adjustment direction. 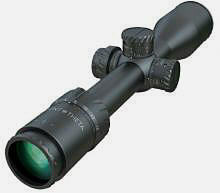 Tangent Theta tactical scopes are built in Canada and are specifically designed and function-tested for long lifecycles in the harshest of environmental conditions. The company has assembled an extremely experienced development team consisting of optical designers, mechanical designers, engineers and international-class long range marksmen. The end result is a series of superior scopes that are beyond reproach in all aspects of design, utility, and service performance.